How confident are you that you know what to do if your dog gets into an emergency situation and needs essential first aid? Knowing what to do in an emergency can, and does, save many dogs lives each year. 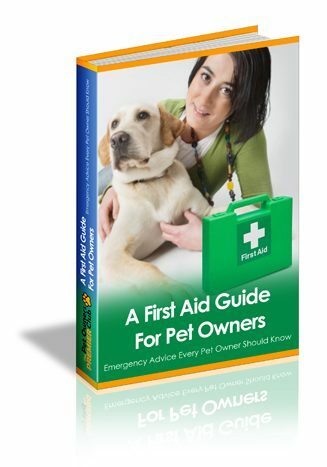 In this special eBook, we have drawn on the experience of experts in the field who have shared valuable information on appropriate first aid for common dog emergencies that your dog, or others, may encounter to help you be prepared. First aid for dogs is knowledge that can benefit every owner. Our eBook will take you through the first aid response to problems such as shock, how to deal with an injured dog, how to calm a stressed dog and much, much more. At one time or another there is a good chance that every dog owner will find him or herself in a position which requires immediate action if the dog’s life is to be saved. All too often, people will simply rush their family pet to the nearest veterinarian, only to find their canine friend dead on arrival. Properly administered first aid could quite possibly have saved the animal’s life, since many deaths are the result of shock and not of the actual injury itself. Any time a dog is injured – whether it be a major a minor injury – there are two primary steps that should be taken. Step one is to stop the bleeding, and step two is to treat for shock. If the injury is considered major, a third step is indicated: getting the dog to the nearest veterinarian. Too often, steps one and two are overlooked – and step three is then no longer applicable due to the death of the dog. Any person who has ever sat through first aid lectures, whether given by military personnel, public schools, or Red Cross representatives, has heard the terms “in shock” or “going into shock”, as well as the term “treat for shock”. Too often, such lectures fail to tell the student just exactly what “shock” is, why it is, and just why treating for “it” is important; yet shock can be the primary cause of death. Shock can accompany such things as bee stings, snake or insect bites, fear, trauma, hemorrhage, burns and certain toxins or other forms of intense pain. It can occur in any situation in which something unusual has happened. Every dog owner should be aware of the simple treatment steps to follow. And even if a dog shows no signs of shock following an injury, it should be treated for it as a preventative measure.